"Bob Hope Show with David Niven"
David Niven was one of Hollywood's iconic personalities and a delight to audiences for years. Niven's screen personality was that of a British gentlemen with a bit of disdain for authority and at least a slight taste for adventure. These traits came directly from Niven's own life; so much so that creator of the prototypical British spy, 007 author Ian Fleming, admitted that the persona of James Bond was based on David Niven. Niven was born into the lower aristocracy by way of the military. His maternal grandfather had been killed in Africa during the Zulu Wars and his own father died during the Battle at Gallipoli. As a young student David was given to pranks and was no stranger to harsh corporal punishment, but he eventually enrolled in the Royal Military Academy at Sandhurst. David did very well at Sandhurst were he developed the "Officer and a Gentleman" traits that would serve him for the rest of his career. However he found service in the peacetime army tedious. After being detained for insubordination, Niven escaped through the connivance of his guard (with whom he finished a bottle of whiskey) and sent a telegram from the ship to America, announcing his resignation. After his arrival in America, Niven had a series of unsuccessful ventures in New York, Atlantic City, Bermuda and Cuba. Finally he found himself in Hollywood at the doors of Central Casting. There seemed to be movie work available, but not without a work permit, so he left for Mexico and survived on odd jobs until his Resident Alien Visa was processed. Before the War, Niven landed several supporting roles in films like Dodsworth (1936), The Charge of the Light Brigade (1936) and the Prisoner of Zenda (1937). He also had a few leading roles, such as The Dawn Patrol (1938) and Wuthering Heights (1939). Niven was part of the Hollywood Raj, a semi-notorious band of English actors that included Rex Harrison, Boris Karloff, Basil Rathbone, and Ronald Colman. When war broke out in 1939 Niven was alone among the Hollywood Raj to return to England for military service (most of the rest were beyond the age of military service, and lacked Niven's training). He was re-commissioned a Lieutenant in the Rifle Brigade, but soon wished for more action and transferred to the Commandos. Later in the War he worked with the Army Film Unit in propaganda films, when he became friends with Peter Ustinov (the friendship was not regulation, Ustinov was a Private, so he was forced to become Niven's batsman). Niven was reluctant to share his war-time experiences, and seems to have looked down on those who did, especially those who had relatively little to contribute. One story that did come out had to do with preparing to lead his men into action. In order to ease their nervousness he told them "Look, you chaps only have to do this once. But I'll have to do it all over again in Hollywood with Errol Flynn!" Niven's post war film career certainly took off with many more starring roles, including The Bishops Wife (1947), The Moon Is Blue (1953), playing Phileas Fogg in Around the World in Eighty Days (1956) and winning an Oscar for Separate Tables in 1958. 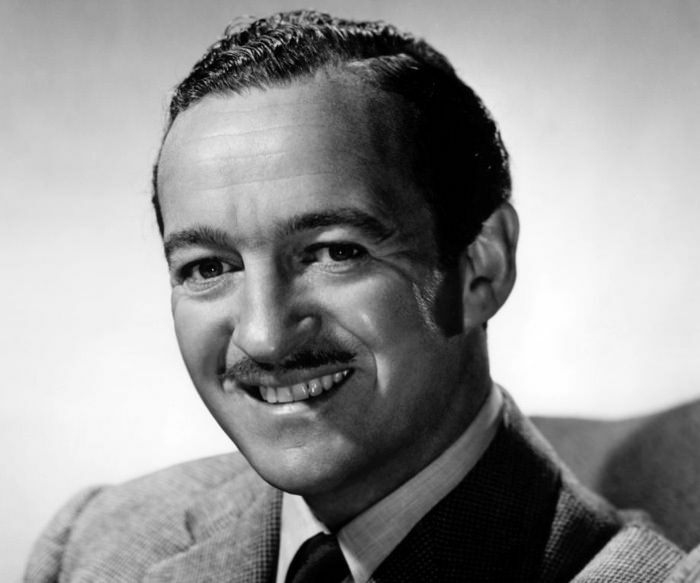 David Niven's radio contributions were pretty typical for an actor supporting his movies, but they are marked with the Niven charm and sophistication. These included guest appearances on variety programs like Rudy Vallee's Royal Gelatin Hour and the Chase and Sanborn show with Edgar Bergen and Charlie McCarthy, as well as creating laughs a number of times with Bob Hope after the War. Many of both his pre- and post war films were adapted for the various anthologies, Lux Radio Theater and Screen Guild Theater, including adaptations of his Christmas masterpiece The Bishops Wife, as well as a pair of appearances on Hallmark Playhouse. A pair of "straight radio" projects include an appearance on the Suspense! episode "Grand Theft" as a suspicious and shifty insurance appraiser, and an ambitious adaptation of George Orwell's 1984 for NBC University Theater. After winning the Academy award, Niven appeared in 30 more films through the sixties and seventies, including The Guns of Navaronne (1961), The Pink Panther (1963), Murder By Death (1976), Death on the Nile (1978) with Peter Ustinov, and The Sea Wolves (1980). One of the all time memorable incidents in the history of the Academy Awards occurred during the 1974 ceremony when Niven, one of the program's hosts, was introducing Elizabeth Taylor to make a presentation. Suddenly a streaker ran naked behind Niven, flashing a peace sign at the crowd. Niven then quipped "Isn't it fascinating to think, that probably the only laugh that man will ever get in his life, is by stripping off and showing his shortcomings?" 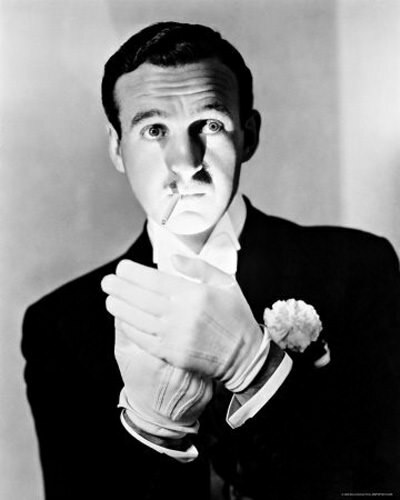 In 1983 David Niven succumbed to ALS, Lou Gehrig's disease. David Niven is honored with a pair of stars on the Hollywood Walk Of Fame, one at 1724 Vine Street for Motion Pictures, and at 1754 Vine for Television. 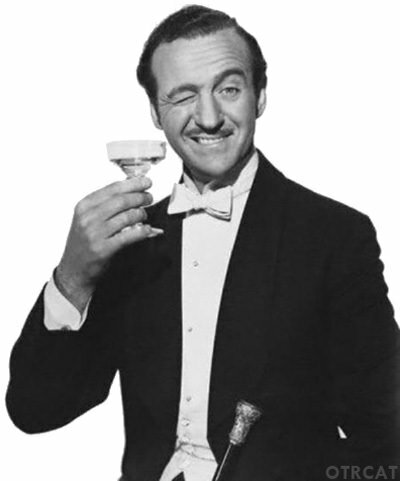 Be the first to comment on "David Niven"